UUnmanned ground vehicles (UGVs) share the same strengths as their aerial counterparts. They can be used for “dangerous, dull and dirty” missions, thus reducing risks for troops, and for “cleaning” the theatre of operations before troops’ arrival. However, poor survivability and the need to find the best payload distribution to preserve stabilisation has prevented UGVs from making further developments. Consequently, they have been mainly used for intelligence, surveillance and reconnaissance, detection/neutralisation of explosive devices and CBRN threats, as well as heavy weight carriage. With UGVs deployment limited to tactical missions, the most developed segment consists of those vehicles with limited dimensions and payload and basic features. However, several states are now willing to better exploit UGVs on the battlefield. This means expanding their operational tasks within strategic missions, namely combat reconnaissance (ISTAR) and fire support. Defence industry companies are extensively working on solutions that could respond to these requirements. Milrem Robotics’ Tracked Hybrid Modular Infantry System (THeMIS) is one of the first hybrid diesel/electric fully modular UGVs. It is a 1450 kg system with a 750 kg maximum payload and is available in three different weaponised configurations. ADDER (the first configuration available) integrates Singapore’s ST Kinetics’ remote weapon station. 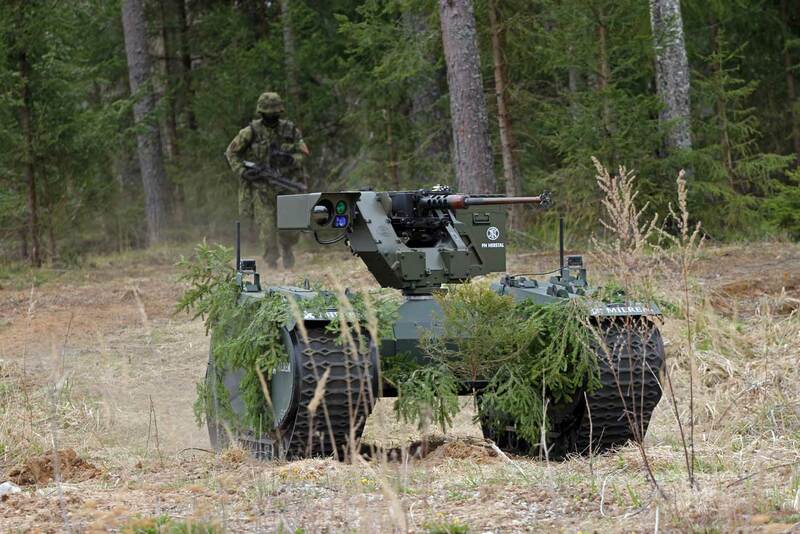 ADDER was tested by the Estonian Defence Forces. The PROTECTOR, launched in 2017, could mount one of Kongsberg’s remote weapon stations. “Weaponised robotic systems are the next generation of warfare that will provide a new level of fire power and most importantly keep our soldiers at a safe distance,” said Kuldar Väärsi, CEO of Milrem Robotics. “And I am not talking about AI-driven systems, but remotely controlled solutions where human operators make all the important decisions,” he added. The Israeli-produced Rambow UGV by Meteor Aerospace, provides an interesting example of weaponised systems used for border defence. Launched in 2017, the 6X6 UGV weighting 3.5 tonnes with a 1 tonne payload can reach a speed of 50 km/h and can move autonomously on a pre-planned route. Other companies are reportedly working on weaponised UGVs, such as Russian firearm manufacturer Kalashnikov, which recently tested its Soratnik (combat weight up to 7 tonnes) and Nahlebnik systems in winter conditions. More recently, Aselsan, General Dynamics, Elbit Systems, CMI Defence and Nexter opted for integrating remote weapon stations on manned combat vehicles. The Israeli Defence Forces’ 8X8 Namer APC will soon have an unmanned turret, as well as its successor, the Eitan APC. However, the most disruptive innovation expected is the Russian T-14 Armata unmanned turret, the first one to be mounted on a main battle tank. The turret will likely mount a 125 mm 2A82-1M smoothbore gun with an automatic loader. Unmanned turrets’ integration on manned vehicles allows for the rationalisation of internal space and leaves room for better protecting the crew. Unmanned turrets’ efficiency is still being debated, but their development is a crucial step along the path towards an unmanned main battle tank. The idea of developing unmanned main battle tanks has resulted in dedicated operational requirements. To date, China and the US are at the forefront of these developments. According to television footage from March this year, China is testing an unmanned version of its Type 59 Main Battle Tank. Despite the vehicle being still under development, the footage confirms that China is extensively working on these technologies. The development of next-generation combat vehicles is gaining critical importance in US military planning. The first of six prototypes — two manned and four unmanned combat vehicles — will likely be tested by 2020. The Remote Combat Vehicle part of the programme aims at developing an unmanned system as fast and light as a Stryker, but with firepower features similar to those of an M-1 Abrams tank. Turkey could follow, as Ankara has already expressed an interest in developing a domestically produced unmanned main battle tank. However, Turkish defence industry currently does not possess enough know-how to respond to this desiderata. Unmanned combat vehicles could become a disruptive technology in the medium term and their spread could be a game changer in the land environment. In fact, unmanned technologies could revolutionise the thinking behind combat vehicles, which is heavily influenced by the need to protect personnel on board. The absence of crew will have a positive effect on armoured protection and, consequently, on weight, leaving room to make combat vehicles more efficient. On the other hand, unmanned combat vehicles mean a higher number of on-board sensors, compared to manned versions, and, of critical importance will be efficient cyber protection and anti-jamming technologies. Unmanned combat vehicles are likely to represent a disruptive technology on the battlefield, bringing to the land domain the same technological revolution that has already occurred in the air domain. Giulia Tilenni is a contributing analyst for leading journals specialising in issues pertaining to defence technology. Her areas of expertise include EU defence and unmanned vehicles.